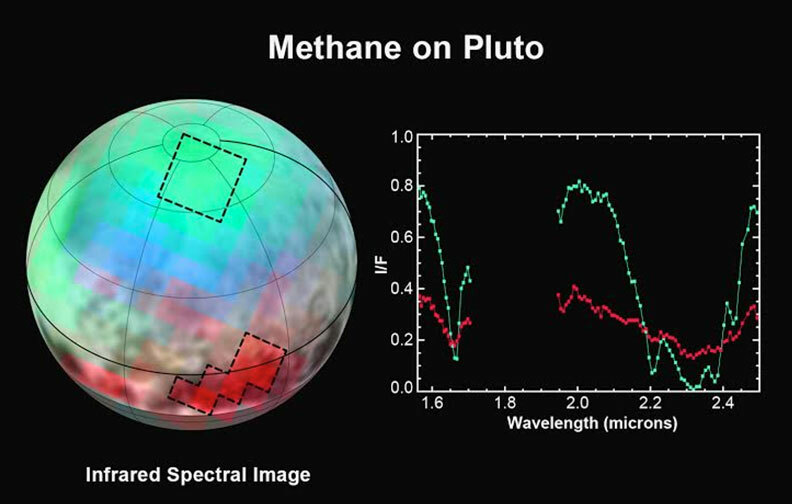 As data from New Horizons continues to come in, the latest spectra from the Ralph instrument reveals an abundance of methane ice with striking differences from place to place across the frozen surface of Pluto. An Earthly example of different textures of a frozen substance: a fluffy bank of clean snow is bright white, but compacted polar ice looks blue. New Horizons’ surface composition team, led by Grundy, has begun the intricate process of analyzing Ralph data to determine the detailed compositions of the distinct regions on Pluto. This is the first detailed image of Pluto from the Linear Etalon Imaging Spectral Array, part of the Ralph instrument on New Horizons. The observations were made at three wavelengths of infrared light, which are invisible to the human eye. In this picture, blue corresponds to light of wavelengths 1.62 to 1.70 micrometers, a channel covering a medium-strong absorption band of methane ice, green (1.97 to 2.05 micrometers) represents a channel where methane ice does not absorb light, and red (2.30 to 2.33 micrometers) is a channel where the light is very heavily absorbed by methane ice. The two areas outlined on Pluto show where Ralph observations obtained the spectral traces at the right. Note that the methane absorptions (notable dips) in the spectrum from the northern region are much deeper than the dips in the spectrum from the dark patch. The Ralph data were obtained by New Horizons on July 12, 2015. 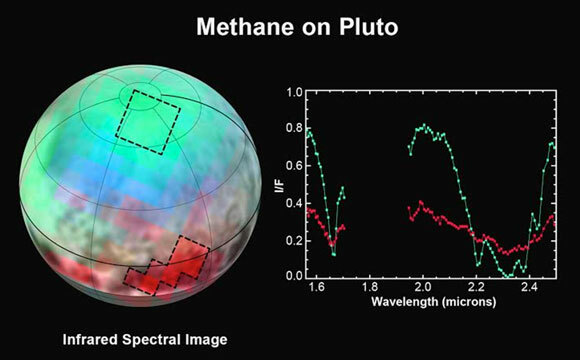 Be the first to comment on "New Horizons Reveals Methane Ice on Pluto"